Aksahya Tritiya falls on 18 April, the third day of the month of Vaisakha. It is also known as Akha Teej and celebrated across entire Northern India. Counted among one of the most auspicious dates of the year, Akshaya Tritiya is eagerly awaited by most families that usually reserve their biggest work for the day. The day is ideal for starting new enterprises or buying new articles. However, like any festivals, the festival is incomplete without feasting on special traditional delicacies. 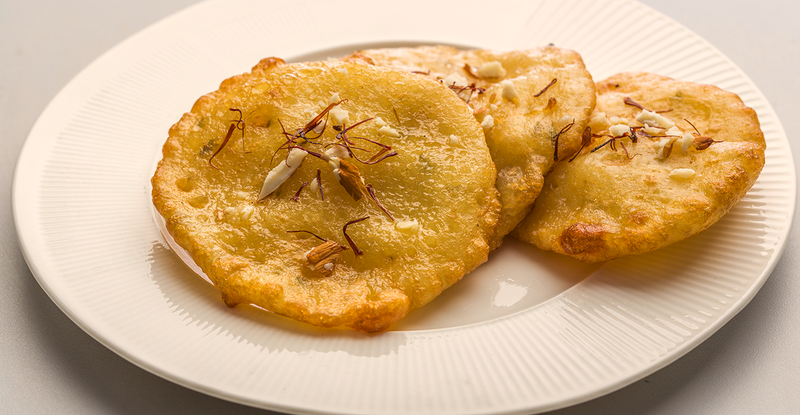 So why not celebrate this Akshaya Tritiya with a few desserts, that too made in a healthy style. Here are a few recipes which you can attempt to create this Akshaya Tritiya an unforgettable one. 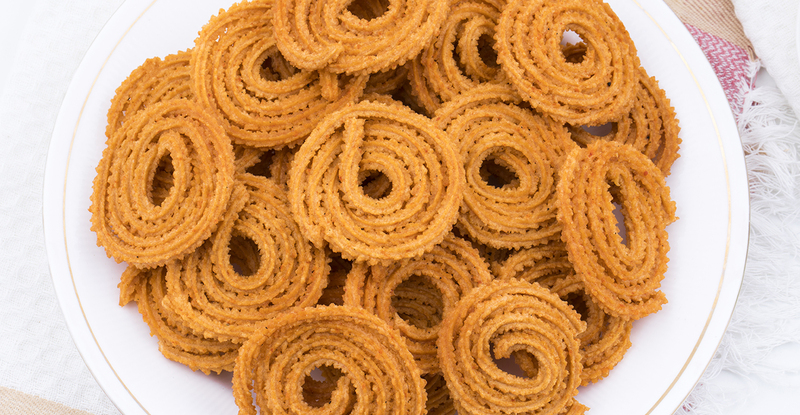 Crispy and crunchy, chaklis are delightful spiral shaped deep-fried snacks, are a treat to have not just during festivities but at any time of the day. To make it healthier, couple it with Nutralite to enjoy this instant Indian vegetarian recipe for Chaklis even more! Crush cumin and ajwain seeds together in the blender. Heat 3 tablespoons of Nutralite. Take rice flour, besan, add crushed cumin and ajwain, coriander powder, red chilli powder, turmeric powder, sesame seeds, salt and mix them together. Pour Nutralite and mix well; now add water and start kneading the dough. Once it’s at a set consistency, let the dough rest for 30 minutes. Use a Chakli maker to shape the dough into that of a chakli. Deep fry the Chaklis till they turn light brown from both sides. Drain the excess oil in an absorbent paper and serve when cooled. 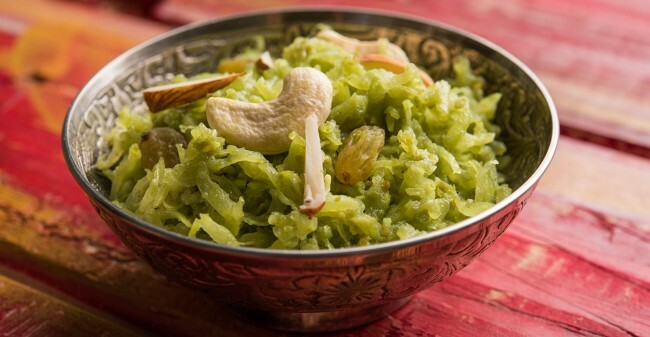 Dudhi or lauki (bitter gourd) halwa is a sweet and savoury veg recipe, relished by many who love the combination of milk and lauki. Eat it hot or cold, it’ll taste as good as any halwa should be. Heat milk until it comes to a boil. In a deep pan, heat Nutralite, add the grated dudhi and saute for five to seven minutes. Add sugar, cardamom powder, almonds and cashewnuts. Continue cooking until the mixture turns semi-dry and the sugar has completely dissolved. Serve cold or hot, as per preference. 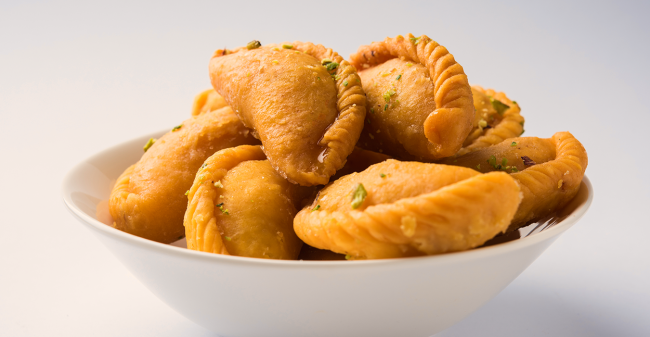 A cure for the sweet tooth and a dense filling of nutrition – gujiyas make for a yummy treat. Here’s how to make it with the perfect balance of healthy goodness and tasty flavours. Mix the wheat flour, ragi flour, some melted Nutralite and water in a bowl and knead into dough. Next, roast poppy seeds and the desiccated coconut separately on a pan. Keep it aside to cool down. Once cooled, grind the poppy seeds and coconut together in a mixer grinder. Then, mix this ground mixture with mawa, jaggery and cardamom powder. The filling is ready. Now, take the dough and make small round balls. Roll out each ball to make a small round roti. Next, place a spoonful of the filling on each of the rotis. Fold them into half and seal the open side by softly folding the edges. Next, preheat the oven to 180 degrees for about 8 minutes. Place all the gujiyas on the baking tray and bake for 10 to 15 minutes. Now, remove the tray from the oven and turn all the gujiyas over, to cook the other side. Bake for 5 to 8 minutes. Once baked, remove from the oven and let them cool. Malpuas are one of the most enjoyed veg recipes of India but high in calories. However, finding ways to make it with alternative and healthy ingredients is extremely easy. Mix the wheat flour, powdered oats and salt in a bowl. Add half a cup of water to bring the mixture to a smooth consistency, just enough to pour on the pan. Now, add jaggery, cardamom powder and half a cup of water into the mixture in the pan. Heat this mixture to make a syrup. The syrup should not be too thick or too thin in consistency. Next, heat a few drops of Nutralite Classic on a pan. Pour some batter and cook. Flip and cook again. Cover the pan with a lid for about a minute to cook it well. Once cooked, dip it in the syrup. Delicious hot and healthy malpuas are ready to be eaten.